I understand the struggle. You’ve fallen in love with a corset style and are eager to make it your own. But in the back of your mind, a niggling doubt; how is that going to sit on my full hips? What about my petite torso length? We’re always on hand to help with any questions you have but here is a quick quide to our standard size styles* and how to choose the best one for your needs. 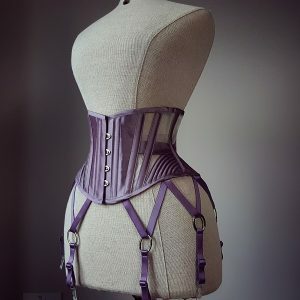 *Naturally all our bespoke corsets are made through a consultation process which would deal with your unique build by starting from scratch with your figure as the canvas. The Seirian and Seirian Luxe are ideal for the most petite frames as they measure just 5.5cm above the waist at the centre front, but the Adara and Eirlys are both still only 11.5cm above and below the waist at centre front and will be suitable for many figures. If you’ve been blessed with a full hourglass figure you may find that many standard size corsets are not roomy enough for comfort. Do remember that we are happy to tweak measurements on our corsets for a small fee if you really want a certain corset style but we have designed something especially for your needs! Our Vala Edwardian underbust is widely acclaimed as our most comfortable style yet thanks to the distinctive generous hip spring that takes the pressure off your curves and really makes your waistline pop! This style also features a dished rib shape to leave more room for your ribcage if you find that is typically a pressure point for you. The Vala is waiting to smooth your curves in blissful comfort! As a taller woman I know that sometimes things sitting at the wrong height can be uncomfortable and also unflattering! Our full underbust styles are cut cleverly to suit figures with an average to long torso. That’s not to say that our waspies aren’t suitable for you, but if you’re looking for greater coverage then these styles will be your friends! The Perle Luxe, Perle in black mesh and Perle in ivory mesh all use the same base pattern which has a high hip (ideal for more movement) and a slightly higher length above the waist than our Vala. If you also want more hip coverage and room for generous curves then our Vala is the perfect choice for you! 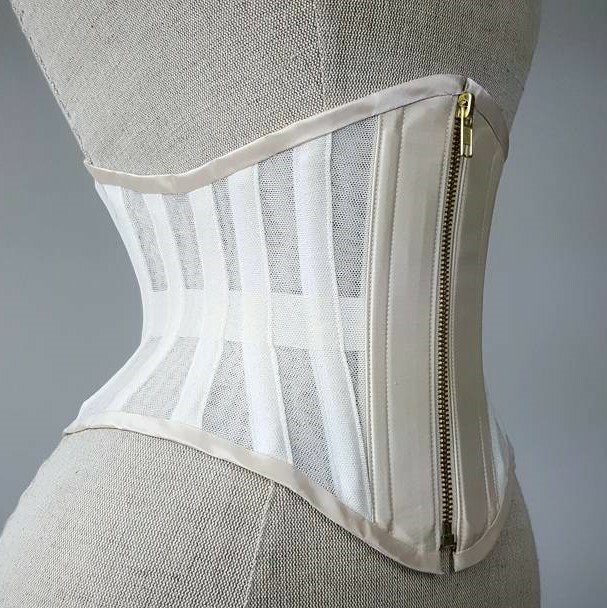 It can be so annoying to find a corset that is comfortable and flattering at the waist but isn’t in contact with the hips or underbust! We can check over your natural measurements against our detailed sizing charts if you get in touch but don’t despair if they aren’t perfect for your sizing as we are happy to tweak the measurements on our patterns for a small fee! This will give you the style you want most with a close fit you will love. 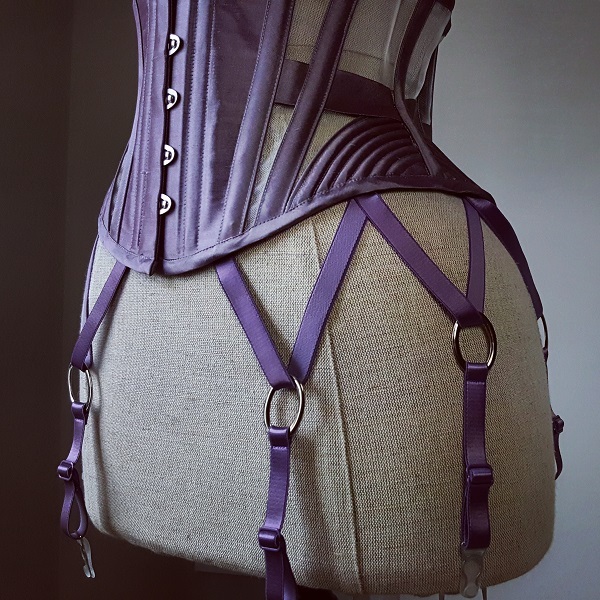 However many clients find that waspies will fit better than full underbusts without alterations as they don’t extend to the fuller parts of underbust and hips, so we can look over those sizes with you as well. Generally speaking, a less dramatic corset style tends to be a good everyday choice, our Perle or Adara shapes are ideal! However the Perle is made from polyester mesh which is quite delicate compared to traditional corsetry fabrics and can increase perspiration so is not the healthiest thing to wear against your skin consistently. 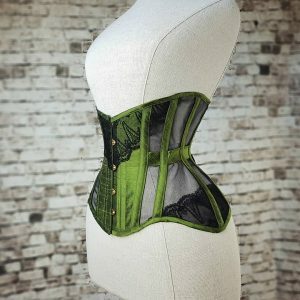 But we are always happy to make a standard size corset in your custom choice of fabric for a small fee which will vary depending on the fabric choice. 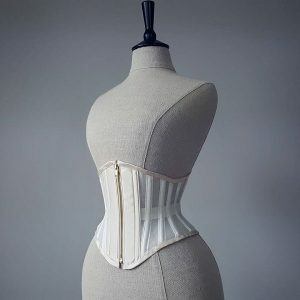 But our Perle made in a cotton coutil fabric would answer a lot of requirements for a regular use corset! 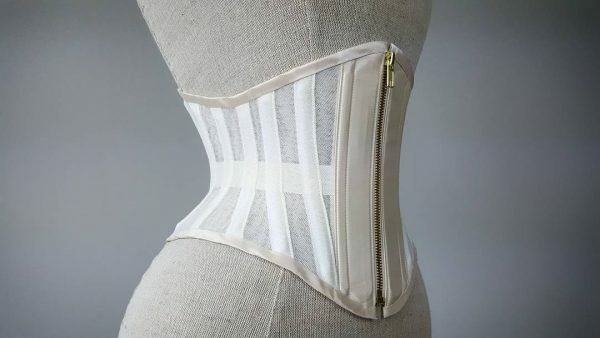 Though not strictly an everyday corset you may also like to look at our Eirlys waspie, made in silk mesh which is an excellent lightweight choice for summer tightlacing! Eirlys is now live in our online store! You can claim yours here. 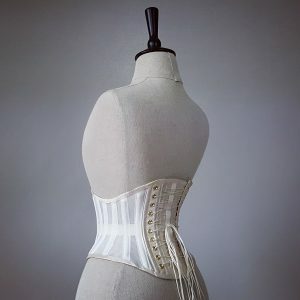 Ivory silk mesh underbust corset. Silk Mesh- What Are The Benefits? Our bespoke clients will already know the benefits of silk mesh corsetry. It is supremely breathable and helps you regulate your temperature in hot weather. It’s slight “give” means that it flexes with you as you breathe and, for those of us used to solid fabric that holds us so tightly, it can feel like you’re barely wearing a corset at all! But our construction means that this corset will hold you curves, cinch your waist and provide a flattering, enhanced figure you will want to show off. 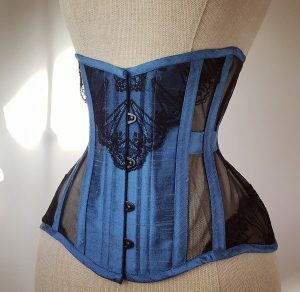 It also makes the perfect stealthing corset! So after a lot of interest on social media, it seemed like it was time to make silk mesh available for our standard size clients to try out! The Eirlys is available in black or ivory silk with your choice of zip or busk fastening, though we can also provide a light golden beige mesh in cotton rather than silk, which we will be adding to the site when time allows to make a sample! If you’d prefer this option just contact us. Is The Eirlys Right For Me? 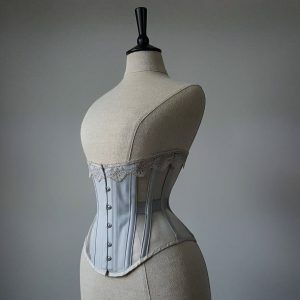 I have noticed a lot of brides to be choosing our standard size corsets for their bridal shapewear, and truly, this is the ultimate under-dress corset. When made with a zip front fastening (or no front fastening at all) it will sit discreetly under clothing and give you the curves you want without discomfort for those unused to corsetry, and without adding bulk beneath your gown. This is also great for tightlacers who prefer to “stealth” or wear their corsets beneath their clothing without detection! Something that has introduced a lot of our regular waist training clients to silk mesh is it’s suitability for night time waist training! 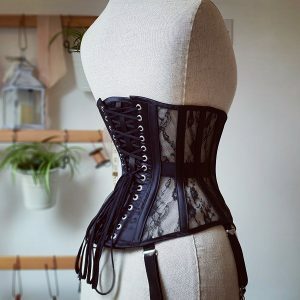 For those who sleep in their corsets, different considerations play a part- for instance, wanting something that will let their skin breathe, that won’t make them overheat and disrupt sleep, and if you’re a wriggler, something that allows good movement! For this, a natural mesh waspie is ideal. It ticks every box! 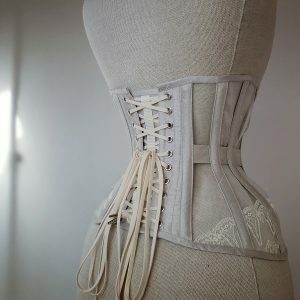 The only people who won’t be especially taken with the Eirlys are those who want a really firm hug from their corsets, or those looking to train a wasp waisted rib shape. The slight movement in the silk means it doesn’t really compress like a coutil corset would, and this means it moulds more to your rib and hip shape than a coutil corset which is more capable of moulding you! We hope you’ll love this new style- although it’s perfect for Summer use, it really is an all year round treasure, and a wardrobe staple with a simple elegance that you will love to wear. Work in progress- moulded silk before it greets steel. ‘Tis the season of shopping, excessive packaging and glitter everywhere! If that sounds a bit “Bah Humbug” let me reassure you- I blimming love Christmas. But seeing piles of sparkly wrapping paper in the trash always makes me conscious of the ecological cost of holiday traditions, so I felt inspired to share the positive story of how we’re trying to fight the wastage of the fashion industry at Orchid. A bespoke order with asymmetric silk detailing and matching lingerie. I think slow fashion is a buzz word that we may not all fully understand. Put simply, slow fashion is about a move away from disposable clothing and garments with built in obsolescence. A move towards long term investment in your wardrobe that doesn’t tread on the workers behind the label. Developing countries are not always able to supply safe working conditions and fair pay whilst meeting the price demands of big high street names. However there are some great brands like Dorsu in Cambodia setting the standard for high quality clothing that supports great working conditions and proper pay. Read to the end for more awesome slow fashion designers you may love! 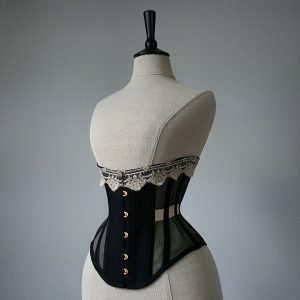 To me, corsets from independent makers are the perfect example of slow fashion at work. At Orchid, there is just me working on your order, through communication, pattern cutting, construction and even the post office run. I have other people who work on my website etc, but the actual labour takes place in my home studio looking out over the Welsh hills. This means no uncomfortable feelings about “who made my clothes?” and knowing that you are supporting the 21st century version of British manufacturing. The cottage industries and small enterprises who exercise their craft with pride. That also means taxes paid in this country, not profits hoarded overseas! 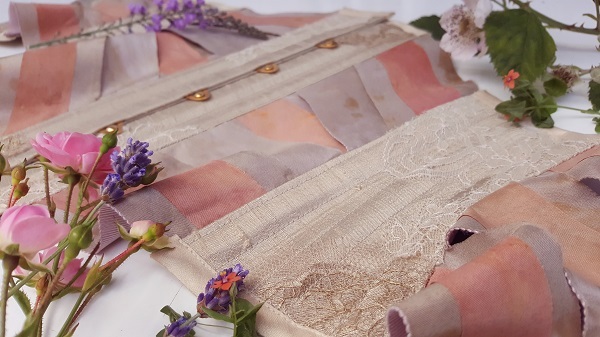 A corset is also, by it’s nature, an heirloom item. It has been crafted to your specifications, we have worked on it together through emails, in person fittings, and swatches through the post. You have deliberated between two perfect shades of blue, and we’ve planned each component to work for your body and requirements. This year I’ve had the pleasure of many past clients returning for new corsets, one of whom had been using their last corset for 7 years! I call that good value for money, and good care of the resources that go into creating a luxury garment. The thing that always held me back from outsourcing elements of my work are questions about waste. 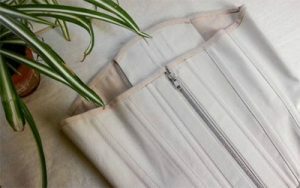 When I cut a corset, I am careful to lay all my pattern pieces in such a way that the materials go as far as possible. This makes financial sense- silk satin is £50 a metre, and some of the lace I use is well over £100 a metre. But also, from manufacturing of fabrics to ordering them in from overseas, there’s a large carbon footprint in what ends up on the cutting room floor. It’s unavoidable that there will be some waste when you cut a garment but here’s what I do to minimise that impact. Any pieces that may be used for cups or short waspie panels on a future order are obviously saved. In the fitting room I have a waterfall of vividly coloured fabrics to choose from, many of which are saved from previous orders. If we have it in stock- you aren’t charged for it. This encourages clients on a budget to choose from the beautiful things that we already have rather than shipping new exotic items across the ocean. Little scraps are saved back for colour swatches for clients or the many patchwork projects I keep meaning to do! I also send packs over to my sister for craft at my nephews’ playgroup, and save up my empty cotton reels for making toy car wheels on rainy days! It might sound silly but little changes can have a big impact when we all take part. 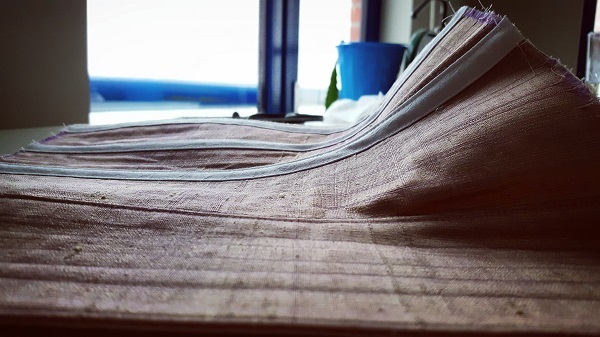 Lately I have started to design new products that use up the awkward off-cuts of luxury fabrics that I can’t bear to throw out but were too small to be useful in a meaningful way. 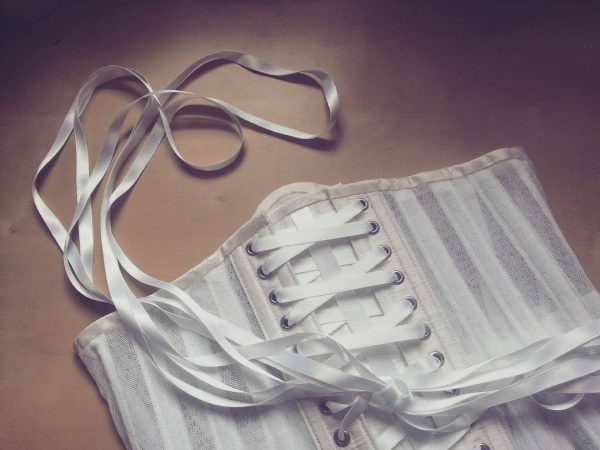 This is how the Isolde neck corset was born! The silk bobbinet (mesh) I use for hot climate corsetry and lightweight shapewear comes in quite narrow widths, and I’m often left with a few inches on the end of a piece that will never be used in a regular corset. These sections are perfect for the delicate panels of a neck corset, and now, when I’m cutting out a waspie and see a space inbetween pattern pieces, I’m cutting out spare panels for the next Isolde order! The silk satin channels that hold the boning also allow me to use short bias lengths of this luxury fabric without cutting it from a new piece. So we have a sensuous new product where I don’t need to charge the client for material costs, and a little less waste makes it’s way to landfill. Everyone wins. Lastly- I do try to keep packaging at a minimum. I want you to feel the thrill of opening our beautiful branded boxes, but I also hope that you keep them after the unboxing ceremony! They make great wardrobe organisers, and stop your corset laces getting tangled with the rest of your collection! Incidentally, all our boxes are made locally in the West Midlands, supporting a company that has been running since 1926, and that gives me a really good feeling! You will often find a thankyou card in with your order and a business card or two, but I don’t send you reams of postcards, catalogs or stickers as experience says, these tend to end up in the bin! If you’ve spotted a way you think we could improve things further it would be great to hear from you- let me know your thoughts about UK manufacture and what matters to you in the brands you support. A Katherine Davidson gown, shot by Sally Sparrow on Abigail. Katherine Davidson is an elegant designer maker based in Merseyside who has a very clever line focused on the capsule wardrobe. She offers a foundation dress that’s made to your measurements at a very reasonable price, which can be reinvented again and again with the accessories and layers she is constantly adding! I am proud to own a KD piece, and can vouch for the craftsmanship, value, and love that she puts into her work. More ethical than slow really! An original and fun alternative lifestyle brand with great designs and real principles. Chyvonne only brings in limited runs of each product and works with ethical producers to make them. She is conscious of sustainable fabrics and biodegradable packaging, but the garments are anything but worthy! I own a ClM hoody and it is my FAVOURITE because I’m a tall woman, but her pieces are tailored and ultra long so I don’t end up with an annoying midriff gap or look like I borrowed my brothers clothes! I really wanted to mention these guys because a) they feature truly wonderful independent designers and artists and b) As a graduated goth I really love their grown up, high fashion witchy look. Using luxurious materials with most pieces being handmade to order in America. They have recently run a project making gorgeous jackets from recycled leather which really excited me. I plan to become a customer very soon! If you don’t know of Maude yet, you will LOVE her. She hand knits perfectly imperfect garments including gorgeous open weave stockings, lingerie and sensuous intriguing cover ups. She is utterly unique and a fascinating designer running her brand in Canada. One of her pieces is currently winging it’s way to me across the sea! Who are your favourite ethical brands?